So, what is being fit? At whatever age you are, or whatever your physical abilities fitness can be described as a condition that helps us look, feel and do our best. Being able to rely on your body when you need it to, whether that is doing household chores, enjoying a brisk walk on a beautiful day, running to catch the bus, working out at the gym or even doing your first marathon! 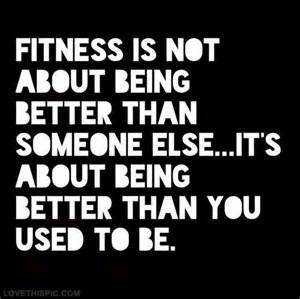 Only you can set your own fitness goals. Your present level of fitness, age, health, skills, interest and convenience are among the factors you should consider. Heart and Lung endurance - the ability to deliver oxygen and nutrients to tissues and to remove wastes for sustained periods of time. Muscular strength - the ability of a muscle to exert force ​for a brief period of time. Muscular endurance - the ability of a muscle or group of muscles to continue applying force. Flexibility - the ability to move joints and use muscles through their full range of movements. Most people are aware of their current levels of fitness, particularly when comparing the above five components. It is always important to exercise safely and effectively. If you are about to begin a new exercise regime you should seriously consider consulting a medical practitioner first. Begin any programme slowly at first. It may have taken many years to make us who are we and pushing too hard too soon may result in frustration and "giving up". Be considerate of yourself and don't be afraid of an occasional "treat". A world full of stopping can feel grey and depressing. Rather than giving yourself messages of "do more of" or "do less of" try doing things differently. (see aspirations to actions). On this web site you will find different sections about ageing healthily, getting fitter, eating sensibly - choose what will work for you and your life style and enjoy the journey.